Featuring some of the most potent and deck-defining cards from the whole Mumbad Cycle, Fear the Masses carries the cycle to its climactic conclusion, but leaves it to you to deal with the fall-out. Sixty new cards (including a complete playset of nineteen different cards), feature plenty to excite fans of both NBN and those Runners who identify themselves as Anarchs. NBN gains a new identity, a new region upgrade, and two potentially game-changing assets. Meanwhile, as they march against Corp HQs, the Anarchs rally the masses toward dissent and high-pressure discard strategies. Of course, there's plenty for every faction, and Fear the Masses offers neutral cards for the Runner that give you good odds of bypassing Corp ice for free, as well as a neutral agenda for the Corp that's worth two agenda points, but only requires three advancement to score. 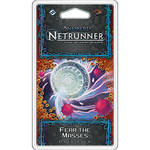 Regala Android : Netrunner - Fear The Masses Data Pack!